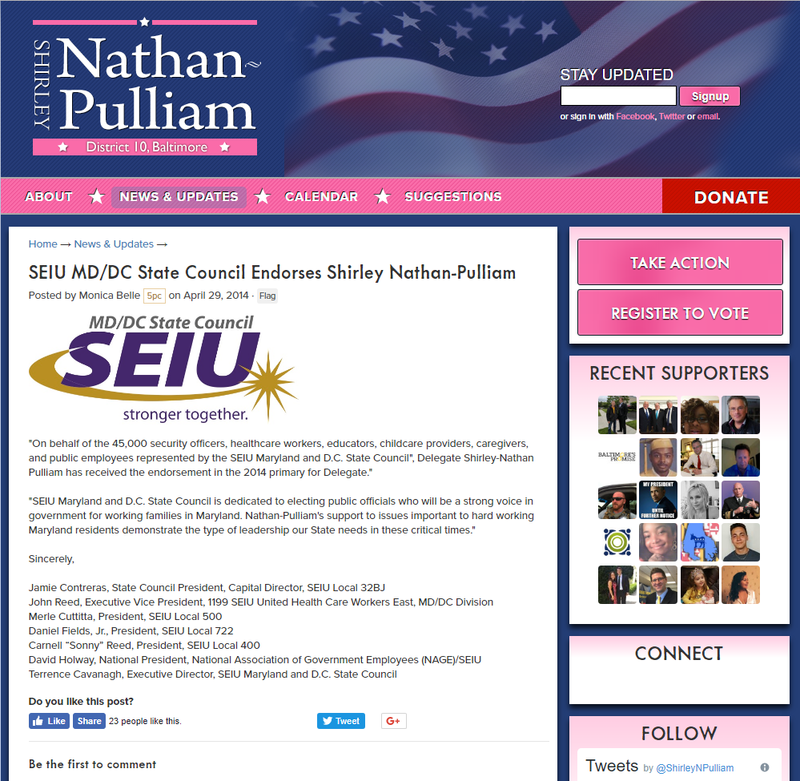 The Service Employees International Union (SEIU), one of Maryland’s most powerful labor unions, has targeted District 44 Senator Shirley Nathan-Pulliam for defeat by running one of their own against her. Aletheia McCaskill, a rank-and-file leader in SEIU Local 500, is announcing her challenge to the incumbent on Saturday. Nathan-Pulliam has antagonized SEIU and several other progressive organizations by dragging her heels on last session’s sick leave bill, which she ultimately voted for. Several things make this race interesting. 1. SEIU has a record of defeating Senate incumbents, including Nat Exum and David Harrington (Prince George’s County), Rona Kramer (Montgomery County) and George Della (Baltimore City). Their negative mail against Exum was particularly devastating. 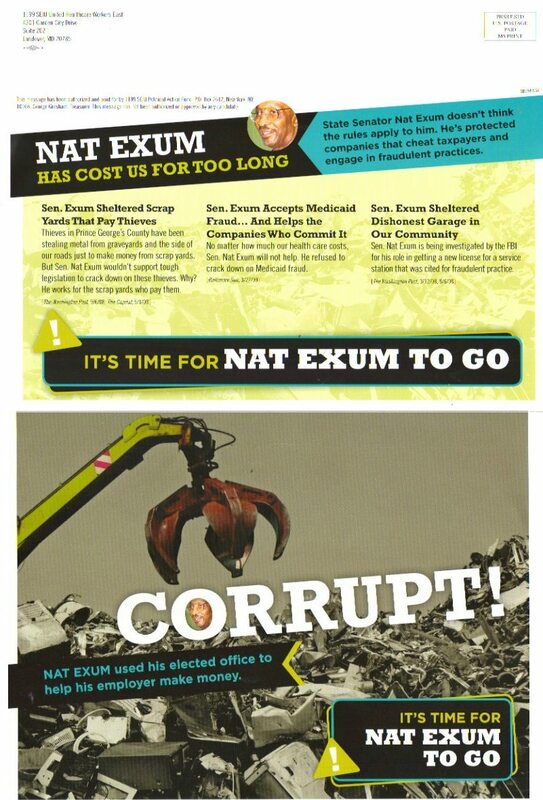 One of at least seven anti-Exum mailers from SEIU. 2. Nathan-Pulliam has not had a truly competitive election in her entire career. She walked into her current Senate seat after the incumbent retired and had five straight cakewalk House races before that. She is also not a great fundraiser, raising $77,695 in the 2006 cycle, $72,363 in the 2010 cycle and $124,732 in the 2014 cycle. She reported $33,533 in the bank in January. Those are easy numbers for a big organization like SEIU to overcome. 3. Many labor organizations have supported Nathan-Pulliam over the years, including AFT Maryland, MSEA, the Fire Fighters, the Police, UFCW Local 400, several building trades local unions, the AFL-CIO and SEIU. Those unions have given her more than $30,000 over the last four cycles. How many of them will follow SEIU’s lead and dump the incumbent? SEIU endorses Nathan-Pulliam in 2014. 4. Nathan-Pulliam has not represented many of her current constituents all that long. True, she has been in office since 1994. But her district has changed substantially since then. District 44 now includes a portion of the western part of Baltimore City along with Lochearn, Woodlawn, Catonsville and the areas around US-40 and I-70 in Baltimore County. Prior to that, Nathan-Pulliam represented District 10. During the 2000s, District 10 did not include any part of the City and during the 1990s, the City portions it did include are not part of today’s District 44. This somewhat erodes the advantage a decades-long incumbent would normally have. 5. At age 78, Nathan-Pulliam could decide not to fight SEIU and simply retire. We reprint McCaskill’s kickoff announcement below. Aletheia McCaskill is a wife, mother, activist and advocate who has owned her own small business providing early learning child care services to the residents of West Baltimore and Western Baltimore County for over 20 years. She got involved on issues of economic justice such as the fight for fair wages and earned sick leave legislation because of the reality she saw in the lives of the families whose children she provided care for. She has been the Statewide Political Member Leader for the largest Maryland local in the Service Employees International Union and has been a leader in the fight in Baltimore and Annapolis to pass the Women’s Economic Security Agenda- a package of bills aimed at providing some measure of economic stability for the working families of the 44th. Aletheia believes that the 44th District deserved a choice, she wants to be our voice in Annapolis fighting for stronger schools and for finally giving our Seniors the services and facilities WITHIN the 44th, that they deserve. 1. Caitlyn Leiter-Mason – Originally from Frederick, Caitlyn has been a fixture in western Baltimore County since arriving at UMBC. She was the longtime President of the UMBC College Democrats and is currently managing rising star Baltimore County Councilman Tom Quirk’s reelection bid. She previously worked for Del. Anne Kaiser–a super star rising in the House leadership. There are certainly great things in Caitlyn’s future. 2. Zach Fang – In my opinion, Zach is now the top field director in the State of Maryland. With a DCCC Pedigree, Zach has returned to the Free State more dangerous than ever. Doug Gansler lucked out hiring this guy. 3. Ashley Harden – According to someone on Gansler’s senior staff, this Northwest Baltimore County field organizer is Doug’s best in the state. One Baltimore based Field Operative told me she’s probably the best seen in the Baltimore suburbs since at least 2006. Anonymous: She’s way too good to stay in Baltimore County, but she just might anyway. Anonymous: The next Ann Beegle. 4. Tommy Underwood – Tommy is a genuinely nice, decent guy–which is far too rare in politics. He’s done a great job so far managing O’Malley speechwriter Nick Stewart’s state house run and has a very bright future. This guy could be the Executive Director of the Democratic Caucus in 2018. Anonymous: He’s not only a plugged-in guy with a very easy-going personality, but he’s also one of the hardest workers I’ve come across and sharp politically. 5. Jahantab Siddiqui – Jahantab (more frequently known as JTab) comes from the politically active Siddiqui clan of Howard County. With an extensive resume that extends statewide, I have no doubt that the next Muslim State Legislator in Maryland will be Jahantab. He may have taken a pass this cycle, but he has District 9 State Senator written all over him. He could be a credible candidate in MD-03 down the line, or statewide. Smart. Charismatic. Handsome. When he runs you can add unbeatable to that list. Anonymous: Mt. Airy (on the HoCo side) statewide college coordinator with O’Malley ’06 campaign, Field Director of Ulman’s ’06 campaign, Mikulski Staffer, Ruppersberger’s ’12 campaign, and currently with MoCo govt. 6. Dylan Goldberg – I will admit that I was for a time skeptical of Dylan. How could someone always be this happy? This isn’t California, so it had to be an act. It isn’t. His incredible work ethic and that same infectiously happy personality are sure to carry him far. Howard County Executive by 2026 or Bust. Anonymous: He’s a bit of a superstar in Howard County, having worked for the state delegation in Annapolis for a couple years after working some local and state races in 2010 (That year, he received the MD Democratic Party’s James W. Rouse Community Service Award). He’s now field director for Courtney Watson’s county executive campaign. He previously worked for Councilwoman Mary Kay Sigaty. Anonymous: He stepped up to lead Watson’s campaign and has done a fantastic job (with a great but not very warm and fuzzy candidate). 7. Marc Szczepaniak – Harford County Young Dems President, UMBC Student and Rachael Rice protege has a terrific future ahead of him, whether in Annapolis or on the campaign trail. Limitless upside and lucky find in one of the tougher county for the Democrats. 8. Nick Stewart – Nick was a speechwriter for Martin O’Malley first as Mayor and later as Governor. He also worked in O’Malley’s press office. He is currently a litigation attorney with the prominent firm Saul Ewing LLP. His next move? Running for delegate in Howard/Baltimore County Based District 12. While the field is large, Stewart is a strong candidate. He would be one of the youngest members of the the General Assembly, but nowhere near the least experienced. 9. Shayla Adams – For the last several years, Shayla has run a 501(c)3 called RemixEducation (whose influence extends from Maryland all the way to North Carolina. She’s also a former Teacher with degrees from Wellesley (Undergraduate) and Duke (M.A.T.). As education disparities between different jurisdictions in the state come into focus, her influence can only grow. Plus, she makes up one half of a Young Gun Power Couple (the other is Prince George’s Young Gun Larry Stafford). Anonymous- Really active in the African American community of Howard. Runs a non profit program. She’s cool with Elijah Cummings and he’s speaking at her scholarship banquet. Is it ever too early to discuss the next cycle of redistricting? The first elections for this decade’s plan are just being held this year since the 2010 elections occurred prior to the decennial redistricting wrangling. But here at Seventh State, it’s never too early to look ahead, so I’ve taken a peek at the Maryland Department of Planning’s current population estimates for 2020. These estimates can only be taken as a rough basis not just because they’re estimates but because Maryland reallocates prisoners back to their home address for redistricting purposes. 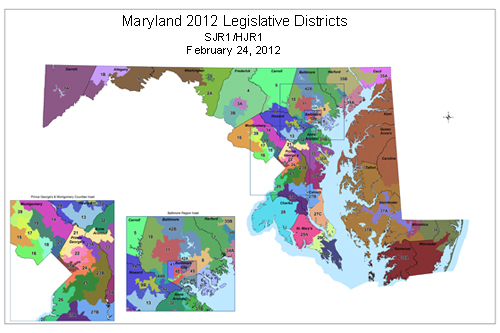 Maryland has been at the forefront of addressing prison-based gerrymandering. The location of a large prison artificially boosts the population of an area even though none of its residents can vote. In Maryland, the allocation of prisoners from prisons in rural areas, such as from the three prisons in Allegany County, just happens to benefit Baltimore City. Long the center of political power in Maryland, Baltimore City’s representation has declined rapidly in recent decades. The addition of prisoners from the City back into its population for redistricting purposes helps slow its steady loss of seats in the General Assembly. Baltimore City will drop to five legislative districts. The City will gain people over the decade but at a slower pace than the rest of the State. Not enough to staunch the loss of political power. In other words, the new Baltimore City delegation will continue the City’s never ending game of political musical chairs, despite its mighty efforts not to cede representation. In contrast, Frederick will gain enough population to incorporate the rest of District 4–its second district. Montgomery will deserve more representation (roughly one-half of one delegate) but will remain close enough to eight districts that the number probably will remain unchanged. The big question is whether Rockville and Gaithersburg will be too large to stay together in one district. The law prohibits unnecessary violations of municipal boundaries, so this could necessitate redrawing the County’s whole map. Prince George’s will lose roughly 40% of a delegate–almost exactly the share that neighboring Charles will gain. While Calvert will see little change, St. Mary’s will come very close to no longer having to share a district with another county. Howard should gain roughly 50% of a delegate–very close to the share than next door Baltimore County will lose. Western Maryland (Garrett, Allegany and Washington) will retain its two districts with few changes. Very little change for the nine counties on the Eastern Shore (Caroline, Cecil, Kent, Queen Anne’s Talbot, Dorchester, Somerset, Wicomico, Worcester). Surprisingly, the numbers also project little change for the Baltimore exurbs of Carroll and Harford. Remember that State law constrains the drawing of districts that violate too many county and municipal boundaries, except to satisfy the requirements of the federal Voting Rights Act. This limit will prevent any attempt to save Baltimore City’s political weight by drawing pizza pie districts out into the County that remain dominated by the City. The State tried this tactic during the 2000 round but the map was overturned in court. Of course, these are really just guesstimates at this point. But it’s fun to peek ahead to Maryland’s political future.